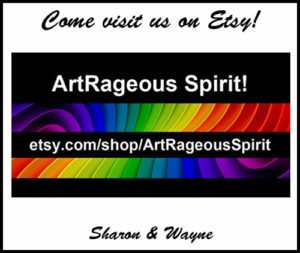 Friday Free-for-All Ferals | Simply Art-Rageous! ← You Do the Best You Can, But….. When I got to school on Friday morning, Jan. 13th, I was relieved to see that my “captives” had made it through the night okay…. Both had eaten and used their litter boxes, and they warily looked at me (or didn’t) when I moved the blankets and boxes. 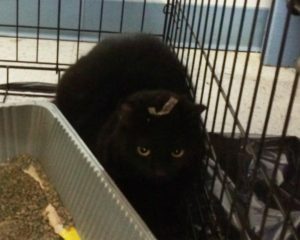 I was surprised to see that the black kitty hadn’t removed the tape (marked “Black Cat #3”) from her head. I guess it had been very busy in the surgery center on Wednesday! I gave them some more food (using a paper funnel to pour it into their bowls), and covered them up again before my first group of students came in the room. During our mid-morning break–which was followed by my planning period–I got together with the teacher who’d found the abandoned kittens to see if we could figure out what had happened, and why two of the kittens had died. 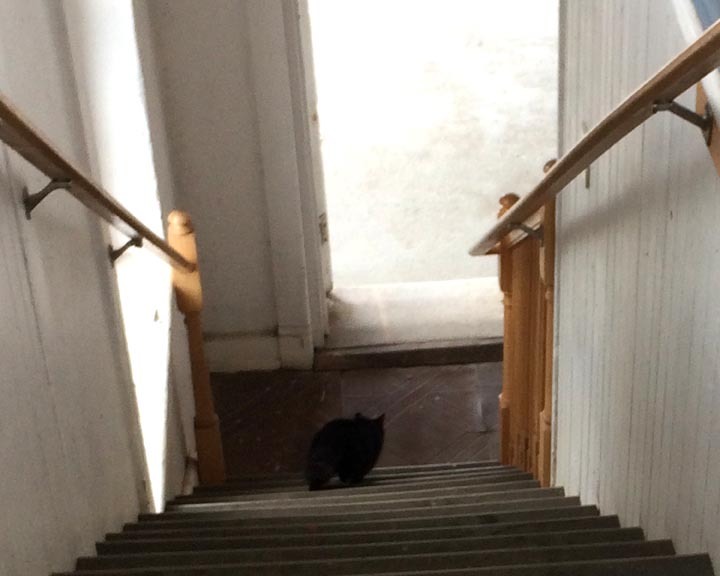 Unfortunately, my theory of “no access” for the mom cat to get back to the kittens seemed very unlikely, as the basement of the old, old building where they’d been found has more holes in it than a chunk of Swiss cheese. At least I discovered that this was certainly a place that a LOT of cats could use to get out of the weather and stay warm if they wanted to! Due to a field trip, I didn’t have any students during my last class of the day. 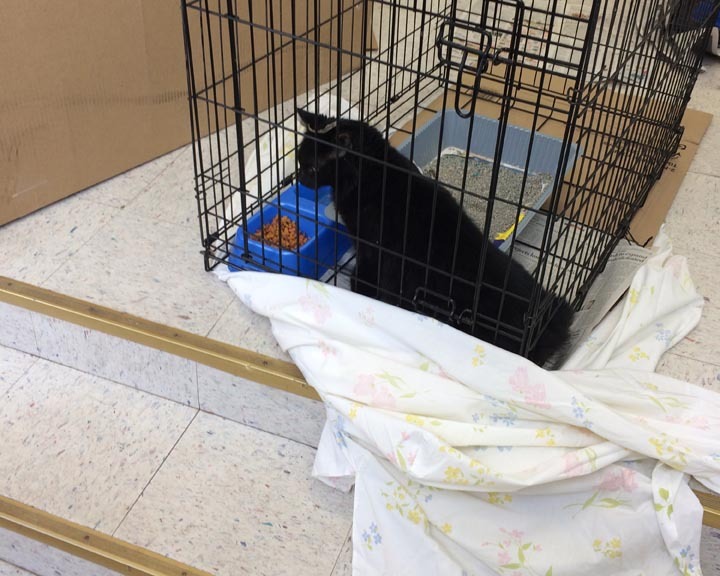 After the other kids had gotten to their classes and the campus was relatively quiet, I decided that it would be a good time to release the two cats in the crates. 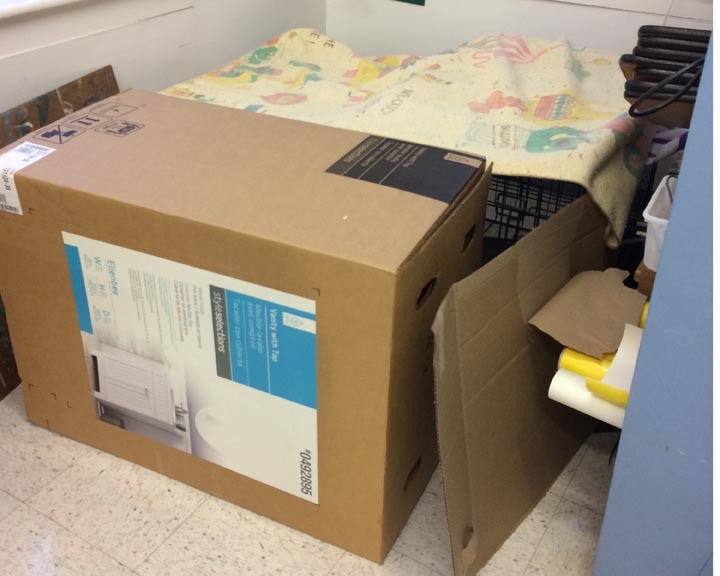 As before, I had to put each crate on a blanket and then drag it the length of my classroom to the stairs. The white & calico girl wasn’t particularly impressed with this mode of transportation, but at least she didn’t start beating herself against the bars of the crate. 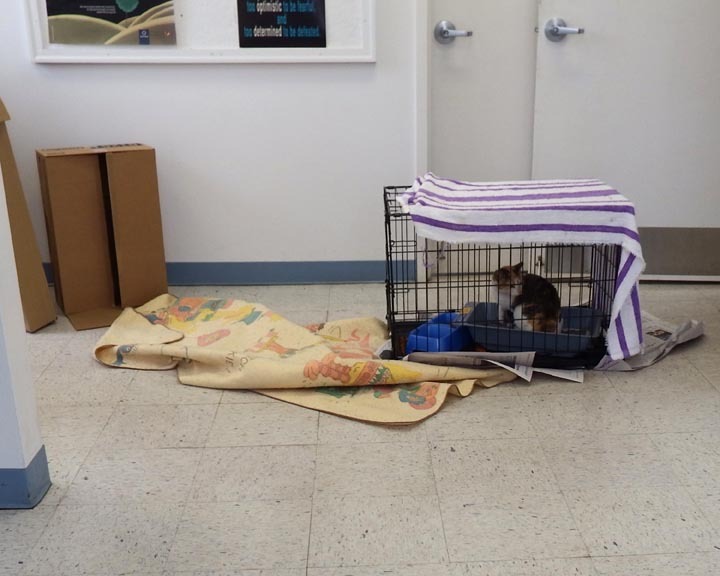 Using boxes and pieces of cardboard to help guide her in the right direction, she hopped out of the crate and made her way down the stairs. When I released the first two cats in December, both immediately went out the door and around behind the art building. This girl, however, went across the parking lot and towards the lotus pond, so I don’t know where her “home” is. I repeated the drag-n-barricade routine with the black kitty. She is SUCH a beautiful cat…. 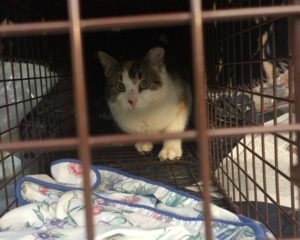 After I’d closed the door at the bottom of the stairs, I moved the smaller crate back into the room and got it ready for the NEXT kitty–the other white and calico cat that I needed to pick up at the SPCA. When I called to let them know that I was on my way to town, I asked what time she’d been spayed. To my surprise, she’d had her surgery right after I’d brought her in on Thursday! That was very good and unexpected news because I thought it would be done on Friday since I’d gotten her to the SPCA clinic late in the day. By now I think I’ve traveled every possible route between the school and the SPCA. Shortest route (but not necessarily the fastest) is about 18 miles, and the longest is about 22 miles…. It was a little before 4:00 pm when I arrived, and a staff member went to the back to get my girl. 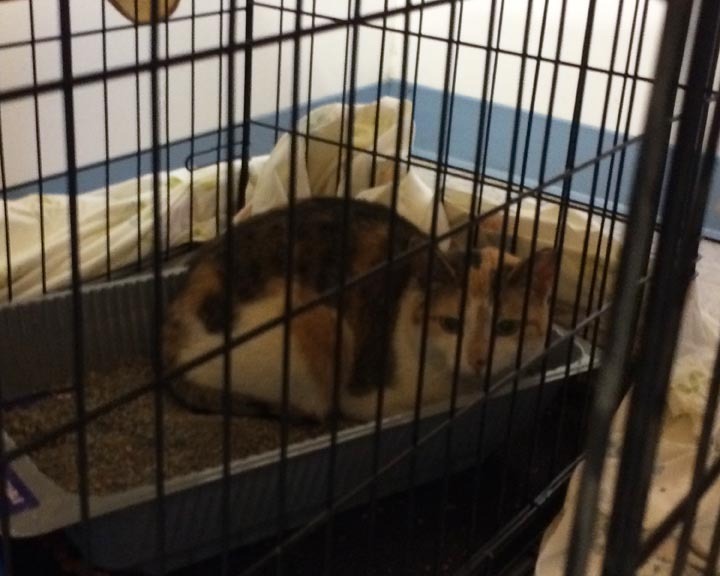 When they brought White & Calico Cat #2 out to the clinic desk–in the trap and covered with a blanket–we started talking about options. I had fully intended to keep her in a crate overnight (especially before I knew she’d been spayed the day before). But it was nearly 60 degrees on Friday afternoon, and I’d be back to the school before it was dark…. If I kept her in overnight, I’d have to let her go on Saturday when we’d almost certainly have rain or freezing rain and much colder temperatures, and there was no real warm up in the forecast until Tuesday. 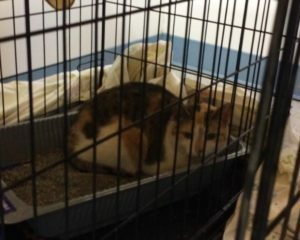 One of the staff members added that this particular kitty really, really hated being caged, and she’d continued to damage her nose on the bars of the trap. For that reason, too, she thought that it would be better to let her out as soon as we got back so she’d have time to get to her “safe place” (wherever that might be). Decision made (with some reservations), I put her in my car and took this picture of her before we left. I don’t know how much these cats understand–I’m sure it’s a totally unsettling experience for them since they’re very mistrustful of humans to start with!–but I talk to them the whole time we’re in the car. I told this little girl that I was thinking about letting her out instead of keeping her confined, and told her, too, that I’m trying to make the best decisions that I can for them. They may not always turn out to be the best decisions, but it’s all coming from a place of love, and that was the best that I could offer. So one more time, I drove around to the back of the art building, and I set the trap down in almost the exact spot that it had been on Thursday morning when I’d caught her. I continued to talk to her, telling her that I loved her, telling her that I hoped she would heal quickly, and asking her to forgive me for all of the scary and painful things I’d brought into her life. Then I opened the door. She quickly ran towards the back of the tractor shed, and I thought she’d zoom out of sight. Instead, she stopped, turned around, sat down, and she looked at me. 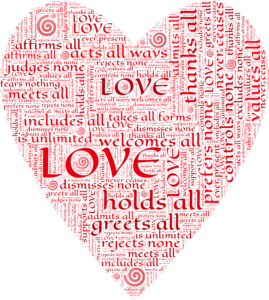 I continued to “think” good thoughts towards her–visualizing my love and healing energy flowing around her–and she continued to sit and to look at me. In that moment, I felt that this little clipped-ear, bruised-nose, and cut-tummy girl DID understand…. I don’t know how long this mutual “looking” would have gone on, because just then some kids came running over, asking if I’d trapped another cat. I told them that I’d just released one, and pointed towards the kitty. They just got a glimpse of her, because she quickly turned and ran down the hill into the woods. Two girls asked if they could help feed the cats–actually begged to be allowed to help feed the cats–and I said that would be great, as long as they understood the situation and the precautions they’d need to take. We all reconvened in the art room, and I gave them food, extra bowls and a lot of instructions, including the part about bringing in the food bowl at night so as not to attract foxes, raccoons or other predators. 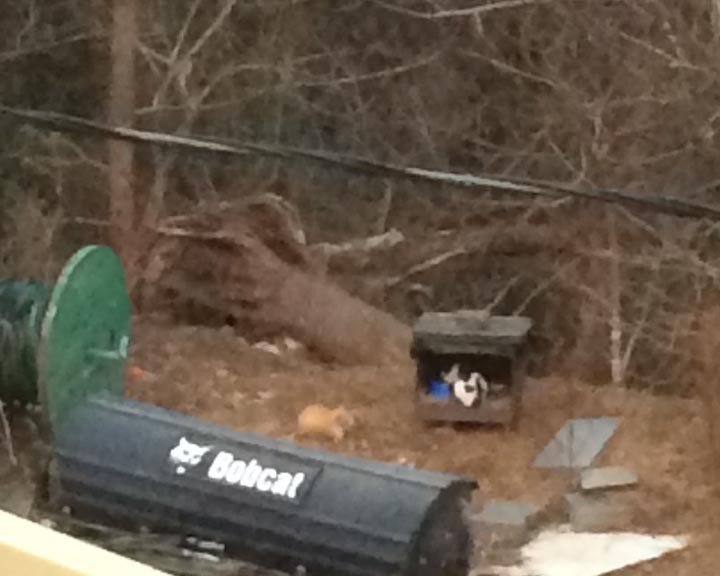 I’d left my camera in the car so I just had my cell phone camera, but when we looked out the window, we could see the orange and white cat (that I hadn’t seen since Wednesday!) and the white and calico cat that I’d released earlier in the day! I could also see the black kitty down in the woods walking towards the feeding station! We were ALL excited! So am I done trapping ferals? I don’t know. I sort of thought I was done after trapping the first two adults and the four kittens! I never really expected to be doing this (any more than I ever expected to get involved with baby bats over the years…). 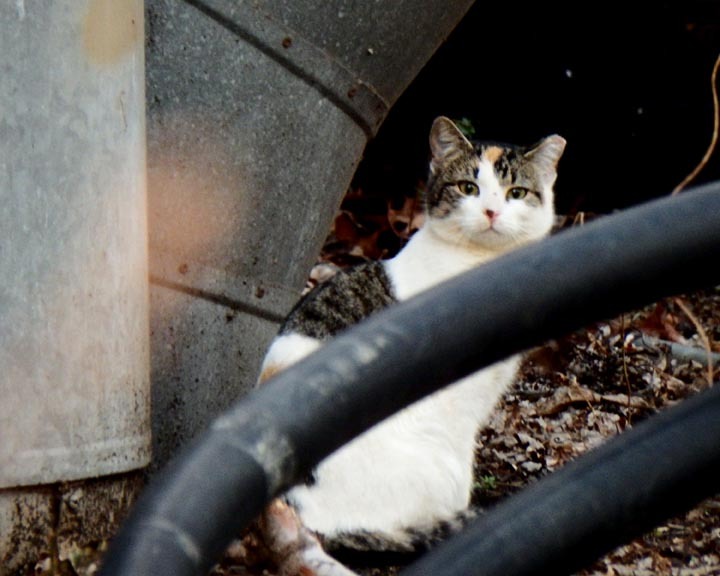 But at least I’ve gained some good cat-trapping skills in the last month, and there’s still an unseen/untrapped male cat somewhere on campus…. Love that quote – I have always felt that way about animals. I love this latest posting, the look on that cat’s face looking back at you is very special – on some level I think she and the others understand that you have helped them. I hope the one little kitten makes it and will eventually get a home and I hope you find that male!! Maybe you have caught all the females so he won’t be able to father more kittens. 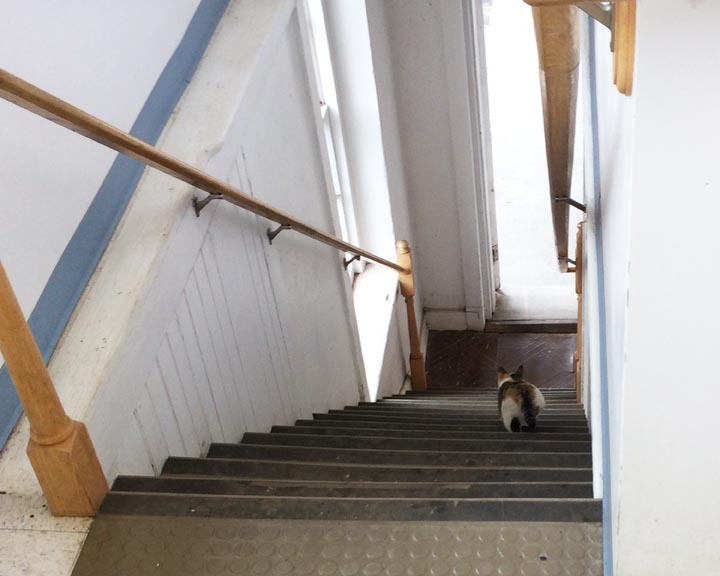 Will you continue feeding the cats moving forward? That can be a long, expensive, exhausting task – if you will then I would like to help again. 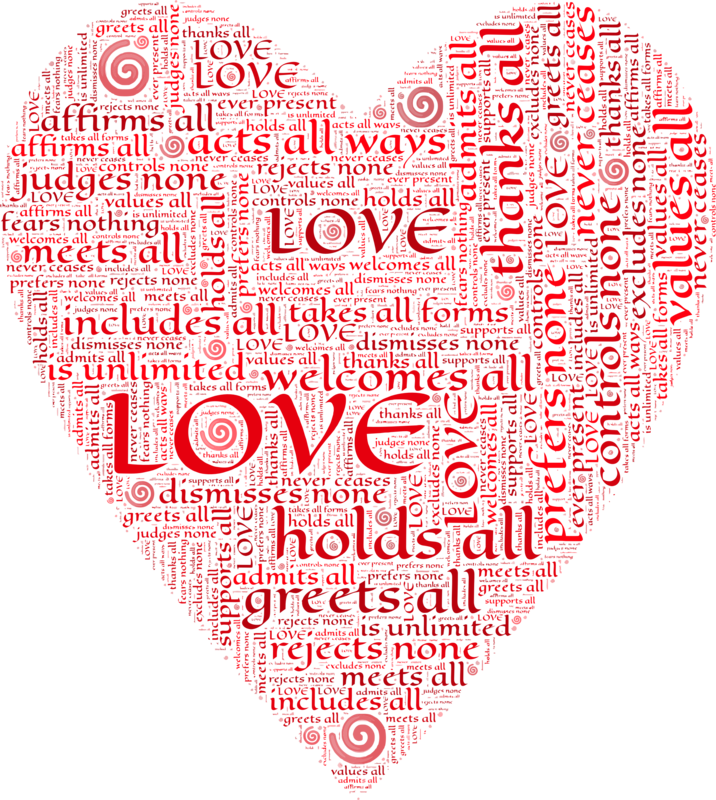 So great that the students wanted to help – they are learning something very valuable about love! Yes, I plan to keep feeding these ladies, and I also might buy a couple of traps to have on hand in the event that I see any new ones (including the male…) The school has one trap which I’ve used, so that’s a start.